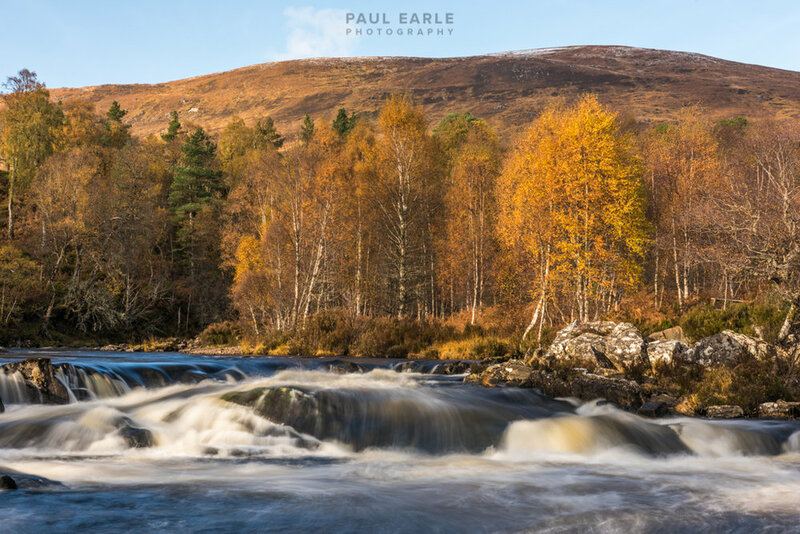 Visiting the Highlands of Scotland for so many years, one season that we have ‘missed’ in the timing of our visits was autumn and so during this October half term holiday we made our first autumn visit, hoping to experience the colours that accompany this time of year. 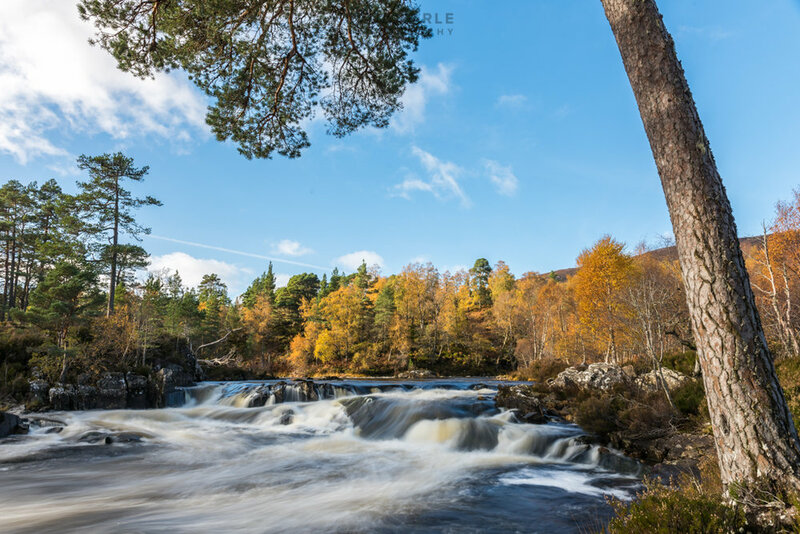 The weather was looking good for the next couple of days, and with the wind levels predicted to be low, I opted to visit Glen Affric on the first full day we had. From previous experience the surrounding mountains limit the lighting during the first part of sunrise, so I adjusted the leaving time to get to the long road up to the glen around the time the sun should have been first clearing the tops of the lower hills. 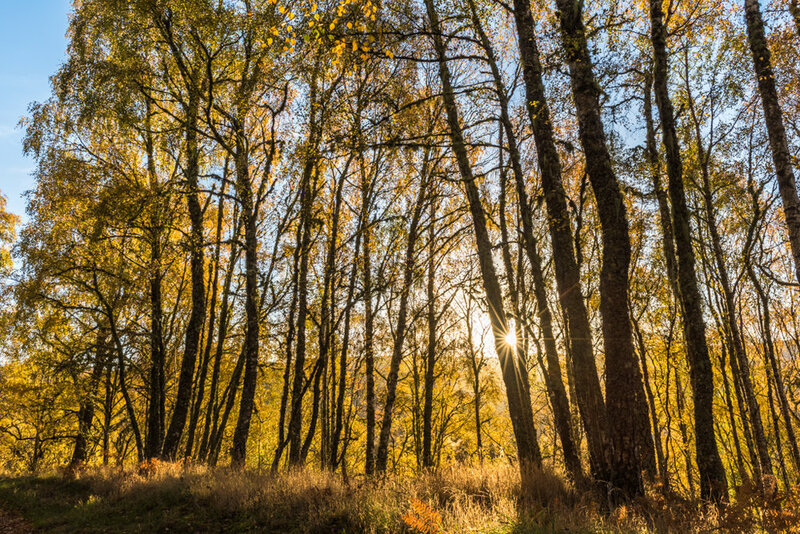 I stopped on the way to capture the atmosphere of the early morning (photo below) and as I continued the journey seeing the tops of the snow capped mountains in the distance turn pink from the sun, I had some doubts whether my choice of timing was right! Travelling to the glen via Beauly, the route takes you down a very scenic valley and on this particular morning the rising mist over the conifers above the river was stunning. There were very few places to stop to record this, but I found one just at the right time as the sun poked above the hillside lighting the ferns in the foreground and creating a truly atmospheric view. I continued on, and began to realise that the timing was working out perfectly. 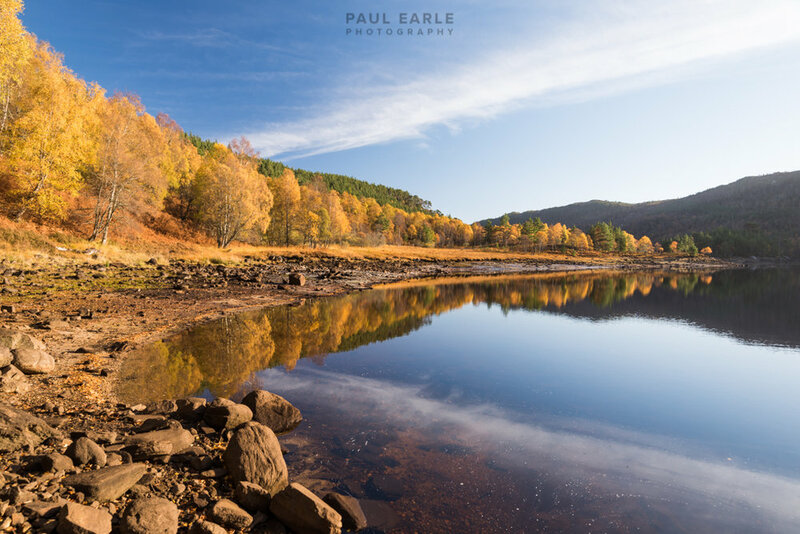 Driving up the long single track road to Glen Affric became a full on display of autumn colour as the rising sun was hitting the trees. Travelling up towards Loch Affric, you pass Loch Beinn a’ Mheadhoin, another long loch, and only a few viewpoints across it from the road with seemingly fewer stopping places! 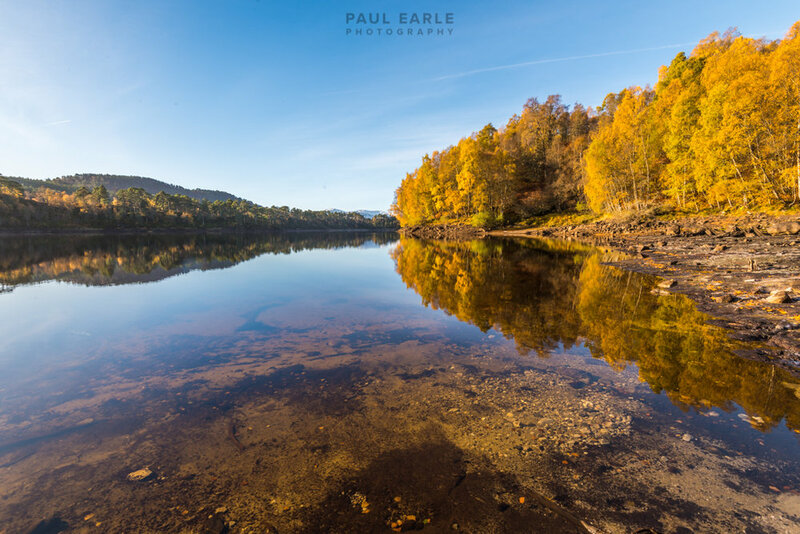 I pulled into one of these stopping places, that didn’t have a clear view of the loch, but grabbed the camera gear and head down the steep slope through the ferns to get the loch side and was greeted with amazing reflections. 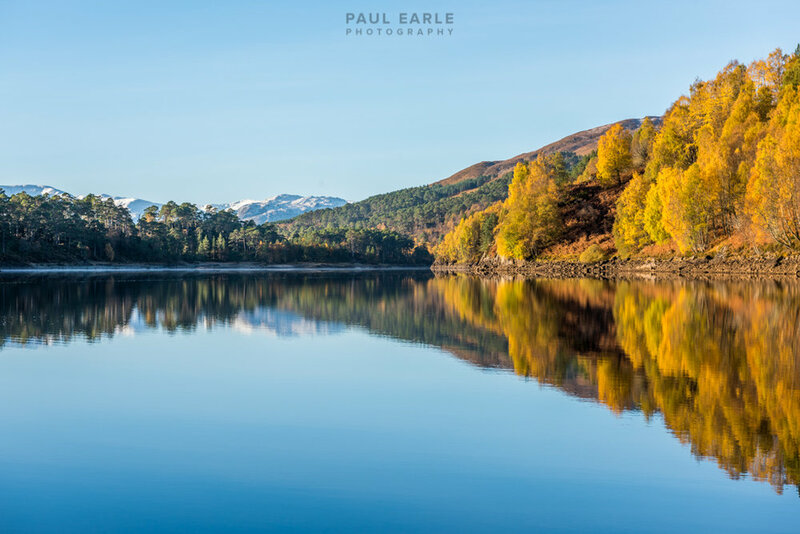 I’ve been to this location a number of times in the past, also when the loch is calm with reflections, but the experience was never anything like this. The sun was rising above the surrounding hills and lighting up the opposite hillside by the loch which glowed with colour. The moon was on its descent but still visible. In the shot below you can see the shadow of the hills behind me. 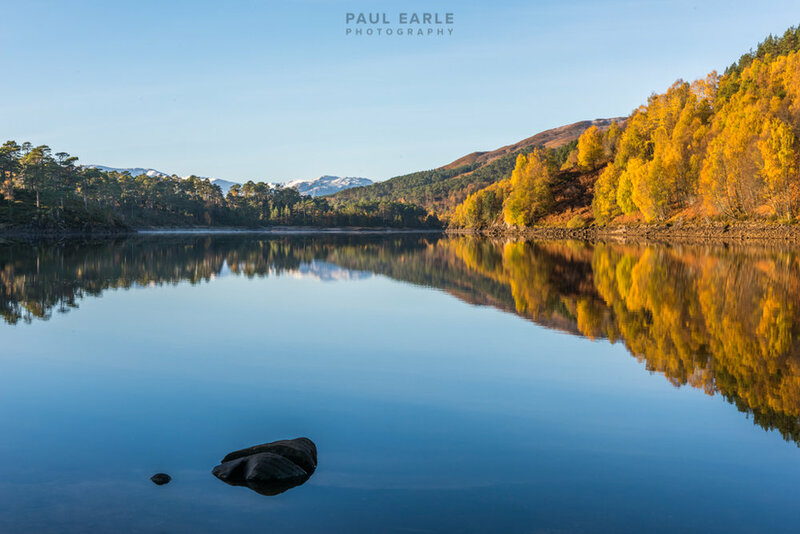 After spending a good amount of time soaking up the views and stillness, ripples started to move across the loch breaking up the reflections and time to move on. I stopped further up the loch in a car park to give Willow some time to stretch her legs and have a good run, as well as more photos! We then carried on up to the final car park overlooking Loch Affric. 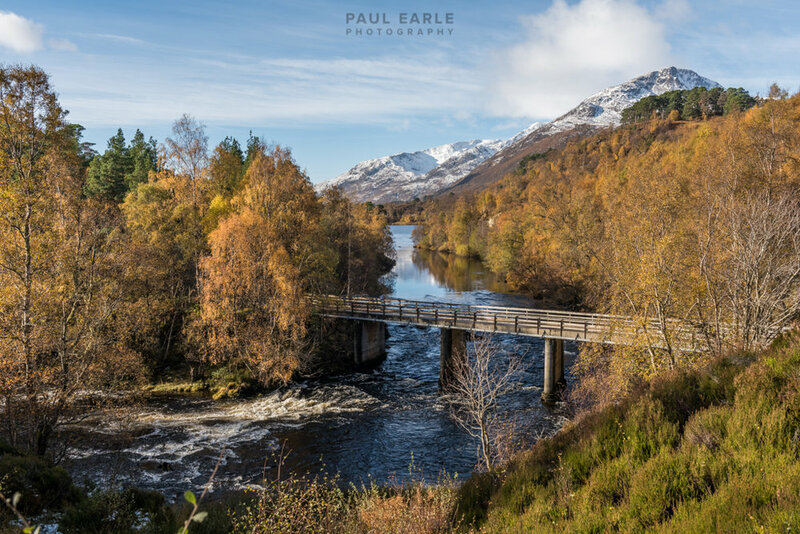 The views around the glen was suitably stunning, with autumn in full display and brushings of snow on the mountains. I was unaware that the wind would die down again, and returning down the glen I stopped off at a different point on the lower loch to get more photos of super reflections, this time with different lighting as the sun completed its course across the sky. Also a perfect time to be out with a canoe! As the hours passed, I remembered that with the daylight savings clock change, sunset was an hour earlier and so decided to wait for the golden hour/sunset and finish day by the loch side. As the light faded colours became more muted and the curtain closed on an amazing visit to this glen! And this was just the start of what was going to be a week of great weather and more great photo opportunities.